Amid a 28% fall in the gold price last year, gold purchases by central banks slowed to 218 tonnes as at the end of the third quarter. The world's central banks changed from being net sellers of the metal in 2009 after two decades of decreasing holdings. Gold movements by central banks are closely watched by the market. None more so than the People's Bank of China. China's gold reserves are officially put at 1,054 tonnes – a number officials haven't updated since April 2009. Rumours about massive purchases – up to 6,000 tonnes according to some estimates or a more modest 300 tonnes over the first six months of 2013 – continue to circulate as the country seeks to diversify its massive foreign exchange reserves which are mostly held in US dollars. Gold makes up little more than 1% of the country's $3.8 trillion in reserves compared to more than 70% for the United States which holds 8,166 tonnes of gold in vaults. "After adjusting for net imports from Hong Kong and domestic output, the figure is closer to 5,086 metric tons [central bank holdings plus private gold holdings]. When taking away gold uses for jewelry, industrial and other categories and adding implied bar demand to central bank holdings, the figure is likely closer to 2,710 mt. "China would need 10 years for its gold holdings to catch up to the U.S., based on adjusted Chinese consumption for jewelry, industrial and other uses and using implied bar demand as the primary driver of incremental central bank additions. 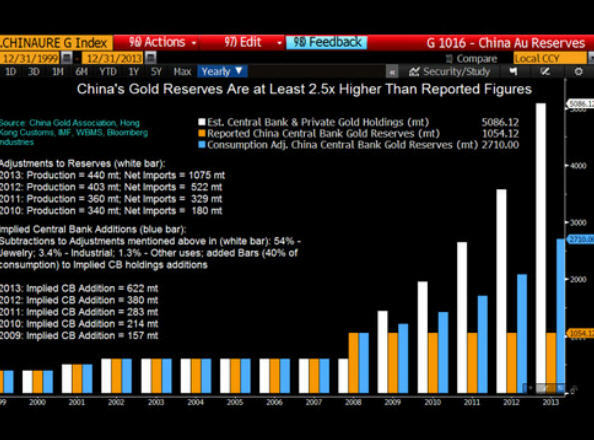 Based on run rates during 2013, China may have added 622 metric tons of bars to its central bank holdings, after adding 380 mt in 2012." 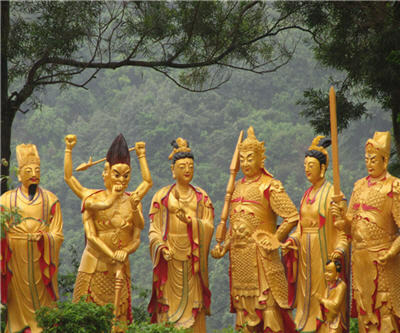 China is the world's leading producer of gold producing an estimated 440 tonnes in 2013, up some 100 tonnes since 2010. Chinese consumer purchases of gold this year are forecast to jump 29% to reach 1,000 tonnes, overtaking India to become the world’s largest user, according to the World Gold Council.